Oxygen - To take away the oxygen leg of the tripod, you may cover all access to air like throwing sand at the fire, stepping on the fire (not recommended) or covering it with a large piece of cloth like a big rag. Combustion - Others would call this component as Heat. 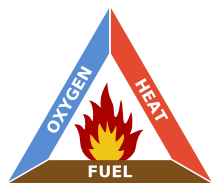 The fire may be ended by dousing the flames with a stream of water, thus stopping the source of combustion. Fuel - Toppling this leg of the tripod means physically taking away the fuel that feeds the fire. In some campsites, all three legs may need to be taken away to definitely put out the fire and prevent dangerous forest fires.